I find it extremely ironic that Webster’s Dictionary defines the word “grouse” as: “1 v. to grumble 2. n. a fit of grumbling [origin unknown].” All grouse hunters who have been outsmarted by a wily ruffed grouse or who have whiffed an easy shot on any kind of grouse know exactly where this word came from. No doubt, I have done my share of “grousing” in the uplands. Take for example my debacle of a sage grouse hunt this past September. To start out with, I came down with the stomach flu on Friday and was not feeling 100% Saturday morning, the sage grouse opener. 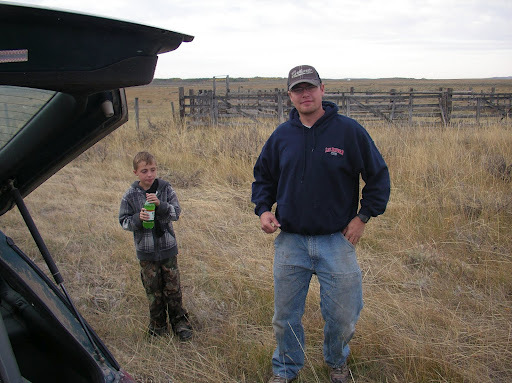 Along for this mis-adventure was my brother Jake and my nephew Jakey. If the stomach flu were not bad enough, we got a flat tire near Rexburg, Idaho as we headed towards our destination. Fortunately, we had a spare tire and a jack, but I did not have the tool that cranks the jack up. With a little ingenuity, Jake utilized a metal bolt and we cranked the jack up one slow turn at a time. What would have taken me at least an hour only took Jake twenty minutes and we were back in business (a little slower–mind you–because of the goofy spare). Even with the lost time, we were all still in good spirits. 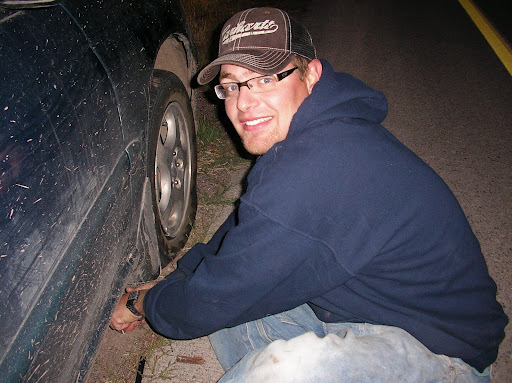 McGuyver (Jake) fixes the tire in record time. Upon reaching our destination, we felt invigorated by the view of the mountainous surroundings in all of their fall splendor. 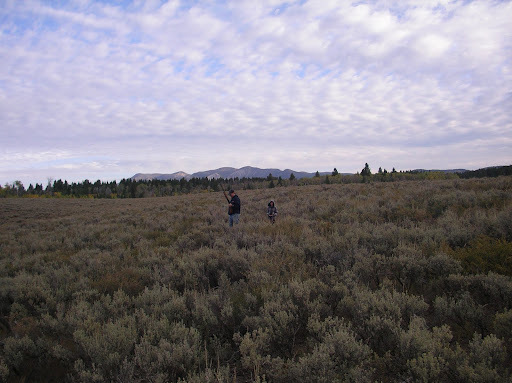 We eagerly released the dogs and hunted up a sage brush bench towards the treeline. As we hiked, chatted, and noisily crashed through the thick sage brush, a large flock of sage grouse flushed seventy yards from our position. Given their jumpiness, we decided not to pursue that flock, but stayed the course in the direction where I had seen many birds in the past. Of course, we split up a little farther and proceeded with more caution. Jake and Jakey work through the thick sage. Soon enough, I walked into a flock of flushing thunder chickens, and promptly missed with both barrels. These types of misses are what I call “groaners” for obvious reasons. Overall, I’ve shot better this year than I have throughout my hunting career. For me, shooting is mostly mental–or rather instinct backed with confidence. Hence, when I miss easy shots, it really gets into my head and the problem perpetuates itself. Not ten minutes later, Jake had birds erupting from all around him and, on his first shot, he marginally hit a big male. But on his follow-up, Jake made a solid shot which brought the big grouse down. 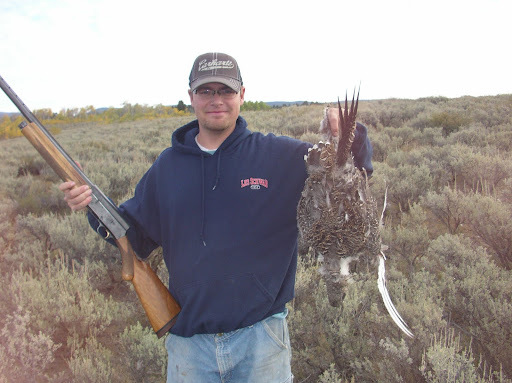 Jake’s first sage grouse–a big male. 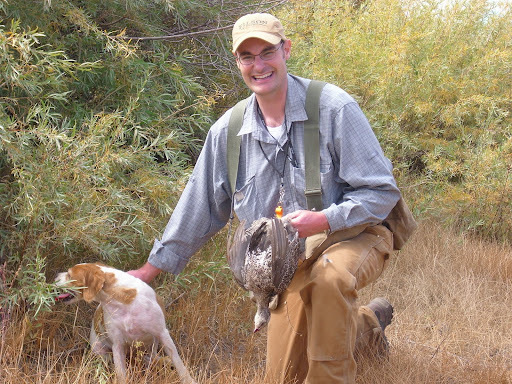 In Idaho, the limit is only one grouse per day. Meanwhile, two of the mega-grouse that Jake flushed crossed thirty yards in front of me and I missed behind them with both barrels. I don’t care what anyone says about sage grouse: Once they get going, sage grouse are as fast and challenging as any grouse I’ve hunted. To underestimate their speed is to miss (which I’ve done more times than I care to admit). While Jake and Jakey went back to the car for refreshments, my French Brittany, Sunny and I crossed a fence to hunt a little piece of cover, I’ve dubbed “The Sunset Strip.” As we hiked through the hundred foot wide strip of sage brush, I heard something creeping through the sage brush. As I approached to within five feet of the noise, I saw a furry black tail ominously raised, which hid most of the white stripe down the small animal’s back. POLECAT!!! And it was locked and loaded. Sunny quickly obeyed, but my command was a little too late, as she had a green streak along her right side where she had just been sprayed. While she did not take the full brunt of the skunk’s attack, the smell was still enough to make my eyes water. Could this day get any worse? I thought to myself. We quickly drove to the nearest town with our heads hanging out the windows. I went into the little town store and purchased the ingredients for the only concoction I know of to get rid of essence-o’-skunk: peroxide, baking soda, and Palmolive dish soap. The store owner was kind enough to allow us to wash the foul (not bot be confused with “fowl”) dog on the lawn with the store’s hose. Sunny Girl gets a scrub down of her life after being sprayed by Pepe Le Pew. After washing Sunny as good as possible, she still stunk, but at least we could stand to be within five feet of her. With that, we loaded up and all climbed back into the still odorous vehicle. “Do you guys mind if we go hunt one more spot?” I asked Jake and Jakey. “We’re going to the Lloyd Christmas Cover,” I disclosed. “Lloyd Christmas? Is that the guy who owns the land?” Jake asked. “Nope. It’s called the Lloyd Christmas Cover because that’s where you go when you need to ‘totally redeem yourself! '” I said quoting the movie, Dumb and Dumber. I explained that a year ago to the day, I did just that in the last half hour of the sage grouse hunt at this very spot. Hence, the name. Recognizing the line, the character, and the movie, Jake laughed. Needless to say, despite all the setbacks, I was still hopeful for the remainder of the hunt. After parking, we walked through the now dry, man-made watering pond, which is immediately surrounded by willows and–outside of that–by a sea of sage brush. Young Misty, my Brittany pup, quickly beat us out of the pond into the willows on the far end and I heard–but did not see–the flush of a bird. I eagerly ran up the embankment to see Misty locked up on her very first point. This naturally caused my heart to pound up through my throat and, to add to that, birds began to erupt everywhere around me. Unbelievably, Misty stayed steady to wing until they were all gone. I was ecstatic and I so wanted to make good on the shot to honor this occasion. However, if my shooting was poor that morning, then my shooting on that occasion was abysmal. 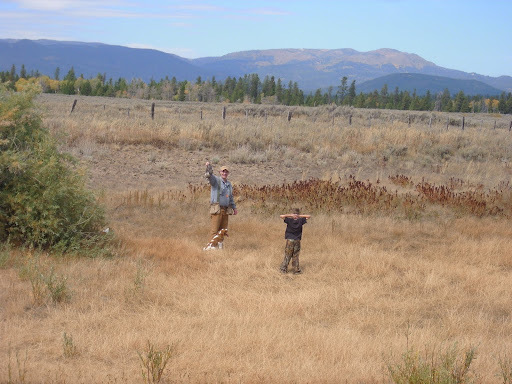 I missed numerous times and the best opportunity I had was on a close flusher that flew right in front of Jake and Jakey, where I couldn’t shoot until it was out of range. Let’s just say that I felt great reason to grouse about my performance, but nevertheless was thrilled for the pup. We looked long and hard for the birds that had flushed into the surrounding sage, but did not find even one of them. However, we did see a lone sharptail grouse, which are not legal to hunt in Idaho until October. As we circled back towards the pond and the car, I realized that the hunt and my chances were quickly coming to an close, but I was not ready to give up just yet. After all, this is the Lloyd Christmas cover. I decided to walk the willows one more time where the birds had buzzed around me like a swarm bees only a half an hour earlier. With almost every grouse species that I’ve hunted, there is oftentimes a straggler who didn’t get the memo to flush with the rest of the flock. Sage grouse are no exception. Sure enough, a grouse flushed only ten feet away, and beelined it for the next county. I instinctively swung out ahead of the quartering grouse and smacked the trigger. The bird crumpled midair and hit the turf. Believe it or not, this was probably the hardest shot of the day, and I made good on it, and with only minutes left in the hunt. Thanks Lloyd Christmas. An outsider looking in on a day like that in the uplands, might ask: Why do you put yourself through such chaos and misery? The truth is, however, that all grouse hunters love the mystery and the adventure that every day of grouse hunting brings. We never know what’s going to happen–good or bad–on any given hunt, but we always hope for the best and keep swinging. There is a fairly common saying among bird hunters about the fact that we don’t always succeed: “Sometimes birds. Sometimes feathers.” To this, I would add for those days when everything seems to go wrong: “Sometimes groused!” I got groused that day for sure! Even with all of the setbacks, however, this day has to be one of my most memorable hunts of all time. I wouldn’t trade it for anything. Anybody with a bird dog, knows that was a great day and memorable hunt. Nice. Andy,You have got to try and get that story published. You totally had me glued. I'm at work and I saw you posted and I thought to myself "I'll just look at the pictures, get back to work, and read the story tonight." No such luck you had me hooked from the first paragraph, I can totally relate to getting groused. I think I recognized the car too and simultaneously thought "groused" ha ha ha. Seriously though great story and awesome day. I sure wish I could come up there and try once more for the big 'uns! When Shawn and I chased them in 2008 in Colorado I was hooked. Too bad they closed the season there in all but that far NW corner. I was going to try once more. Afraid Fr. Time has now closed that door for me.